Bergen is a charming and historical city, and its old Hanseatic buildings along the waterfront are a UNESCO World Heritage Site. Cruise ships sailing the Norwegian fjords of western Norway almost always include Bergen as a port of call. Ships with northern European itineraries also stopover since Norway's second largest city has much to do and see for visitors. Hurtigruten, a Norwegian cruise/ferry/freight company, sails one of its coastal liners every day from Bergen. These ships make the roundtrip voyage to Kirkenes above the Arctic Circle, returning 12 days later. Cruise passengers can stay on for the entire voyage or disembark to spend more time in some of the quaint villages or towns where the coastal liner stops. Cruise ships dock either at Skuteviken near Bryggen on the main Vagen Harbor or at Jekteviken near the business district. Passengers can walk into town from either port, although some ships provide a shuttle from Jekteviken. Although ships offer many shore excursions in Bergen, those who like to walk might want to just explore on their own. Many of the historical buildings are on Bryggen Wharf, and the Torget (market) on Fish Square at Vagen Harbor is not to be missed. If it's a beautiful day, be sure to ride the Floibanen Funicular to the top of Mount Floyen. 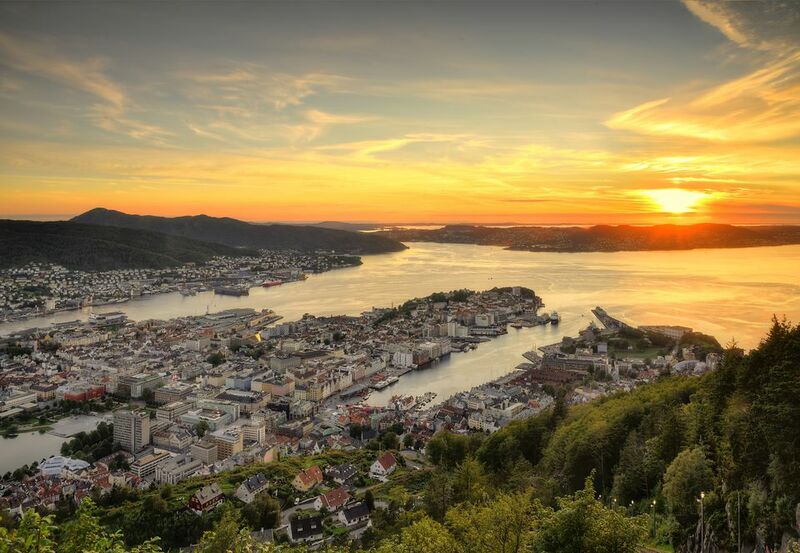 The views of Bergen and the harbor below are spectacular, and the hiking trails are well marked and interesting. Those with more time might want to venture a little outside of Bergen to visit the home of Norwegian composer Edvard Grieg. Afternoon piano concerts of his music are often held in a concert hall on the grounds. Tours are sold at the Tourist Office near the Fish Market on Vagen Harbor. Rosenkrantz Tower, which is a 16th-century fortified tower and castle, greets visitors at the Jekteviken Harbor. Rosenkrantz Tower sits next to Haakon's Hall and is also on the grounds of Bergen's old fortress. It was built of stone in the 1560's and survived many fires. The first recorded party in Haakon's Hall was the 13th century, 3-day, 1000-guest celebration for the wedding of King Magnus Haakonsson and Princess Ingeborg of Denmark. Like nearby Rozenkrantz Tower, Haakon's Hall is built of stone and survived the numerous fires that plagued the wooden buildings of Bergen over the centuries. However, during the 5-year occupation of Norway by Germany in World War II, Haakon's Hall was extensively damaged in 1944 when a Dutch ammunition ship exploded in the harbor. It has been reconstructed. This large grassy park is near Hakonshallen, Bergen's old fortress. Cruise ships dock along the pier or Bryggen Wharf. The Bryggen is the old wharf running alongside the harbor in Bergen. Many of the original buildings were destroyed by fire but have been reconstructed. Bryggen is the site of the historical Hanseatic merchant's warehouses. Today the reconstructed buildings are filled with shops, restaurants, and bars. Near Fish Square, these quaint old buildings sit on the waterfront and have Mount Floyen behind them. Be sure to take time to explore this daily fish, fruit, flower, vegetable, and tourist market at the end of Vagen Harbor in Bergen. It's fun to see all of the different fish, vegetables, fruits, and souvenirs for sale at the Torget Market. 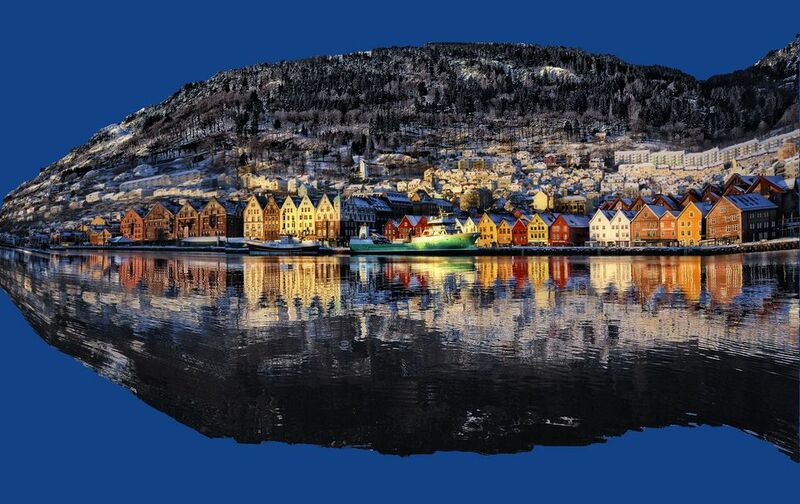 The city of Bergen dates back to the 11th century. It was once a Hanseatic League port and the capital of Norway. Today, Bergen is Norway's second largest city. The main square of Bergen is on the opposite side of the Torget Market from Bryggen and the funicular to Mount Floyen. The figures on the Seafarer's Monument all had something to do with the sea. Riding the funicular is the easiest way to climb up Mount Floyen. Riding the Floibanen Funicular to the top of Mount Floyen is a great way to see the city and to hike in some amazing countryside. The station is near Bryggen. The views from the top of Mount Floyen in Bergen are gorgeous, including this one of the Maasdam. Isn't this view of Bergen from the top of Mount Floyen spectacular? The top of Mount Floyen is crisscrossed with miles of walking trails. Most are circular and less than two miles. The forest is beautiful. Bergen is very green because it gets lots of rain. Be sure to carry along a raincoat when walking the city or on Mount Floyen. This lovely lake is near the funicular station and features a wooden shelter, barbecue and campfire facilities, and swimming and boating. Some hikers climb up this high rocky outcropping, but the less adventurous hikers can choose to hike the rolling hills along the top of Mount Floyen. Trolls are one of the symbols of Norway, and statues of them are frequently found in front of souvenir shops.